A few weeks ago, Susan and I took a Thursday off of work to go on an adventure run. We had requested the day off months ago, but what we hadn't planned on was going on a 37 mile run a few days before. Our 37 mile run was supposed to be a 20 mile run but due an extreme stream crossing we had to backtrack. Given that epic adventure I decided to go with a route I was very familiar with for our Thursday run. Since the snow line was still relatively low, I decided we would run a Salmon River route. Instead of our typical Salmon River - Kinzel - Hunchback Mountain - Green Canyon Loop, I decided to change it a bit and start at Salmon River and run up Kinzel to Hunchback Mountain and all the way down Hunchback Mountain to the Zig Zag ranger station, which is ~18 miles. Luckily my mom lives a few miles from the Zig Zag ranger station and could meet us to drop us off at Salmon River, so we could run back to our car. We got to the ranger station before my mom did. We thought it might be a good idea to go in and ask about the conditions of the trail, since we didn't do that on our 20-mile-turned-37-mile run. The ranger told us they were unsure of the conditions of Hunchback Mountain since no one had given them a report this year, but if we did complete it we should come back and let them know. That gave us both pause since we didn't want a repeat our crazy run from a few days before. We talked it through and decided that if Hunchback Mountain was unmanageable for any reason we could take the Green Canyon trail down to Salmon River road and run 6 miles on the road back to our car. I knew that Hunchback was going to be slow going regardless, as there are so many down trees that never get cleared. Despite having a lot of miles on our legs already, we ran most of the Salmon River trail and it felt pretty good. As we were hiking up the Kinzel trail we ran into another runner who was coming down and we chatted about our different routes. I told him that the ranger wasn't sure about the conditions of Hunchback; he said he had done it the week before and the trail was in normal (downed tree) condition with very little snow. We were both very relieved to hear this news. After making it to the top of Kinzel we made our way along Hunchback for ~1.6 miles to Devil's Peak Lookout, which made for the perfect spot to take a break and have lunch. We then slowly made our way down Hunchback Mountain, going over and under more trees than I could count for ~8 miles. Just when we thought the downhill would never end we saw the parking lot. If our quads weren't shot from our 37 mile run, they definitely were from Huntchback and all the blowdown. Luckily the ranger station was still open and we were able to give our trail report. 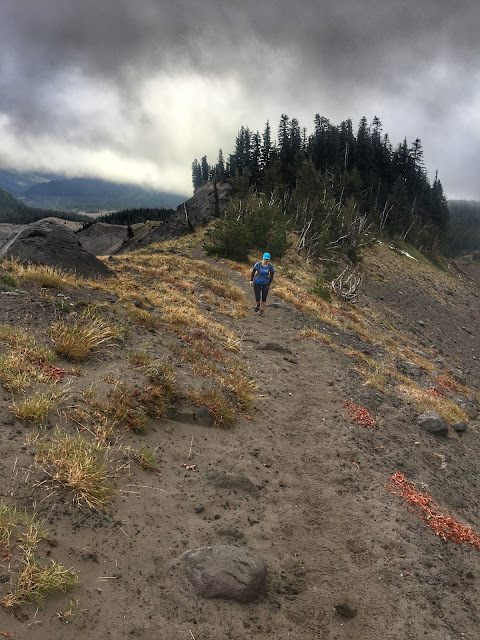 I was really happy that we were able to give an update on the condition of the trail, because being able to get recent trail information was what helped us make a crucial decision when we had to backtrack on our Siouxon Creek run. When I used to backpack all the time I was really good about calling the ranger stations and posting on Oregon Hikers. I don't know why I haven't been as good about this with our adventure runs. 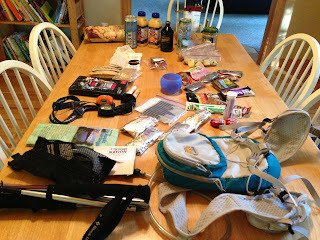 They are no different than backpacking routes I have planned, they just take 1 day versus multiple days. But I will get back into this habit and encourage other people to as well. 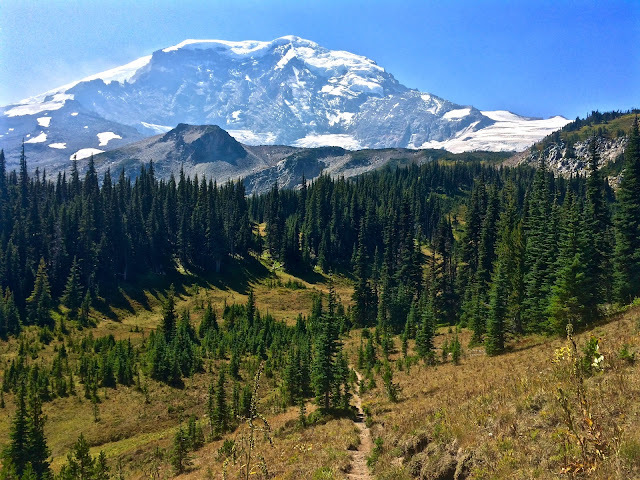 Washington Trails Association for Washington trails is another great resource for up to date info on trail conditions.